Splinter Cell: Conviction used to be merely "brilliant," but now it's going to be "awesome," says Ubisoft - which is why the game's being delayed. The bad news: The release of Splinter Cell: Conviction has been pushed back, with Sam Fisher slinking his way from February 26th all the way back to sometime in fiscal year 2010 (which starts in April). What could the reason possibly be? Is it because Ubisoft isn't finished with the game yet, and a delay throws questions about quality into the mix? Is it because Ubisoft is worried about competing with a significantly stronger-than-usual first quarter? The good news: Nope, it's just because the developers wanted to take the extra time to polish the game and make it as super-shiny as they possibly could - at least, according to an Ubisoft spokesperson who spoke with Eurogamer. "The game looks brilliant, but we want it to be awesome," quoth the company representative. Well, that's good to hear, assuming you take them at their word, anyway. A delayed game will come out, but a bad game is bad forever (or until it gets patched, these days). So just keep on waiting, and keep on hoping, and then you'll eventually be able to get your hands on one of the year's most highly-anticipated titles ... but we don't know when. 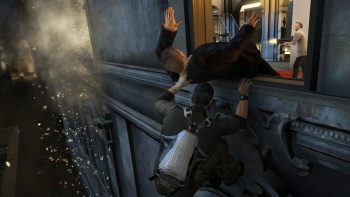 That Sam Fisher is a sneaky one, that he is.